Finally induced at 41 weeks and 4 days, the day had come. Tom and I arrived at the hospital ready for our new adventure as parents and so excited to meet our little girl yet feeling every emotion possible. As I walked in to the hospital, I knew the next time I left my life would be forever changed. Libby arrived at a healthy 8 lb 15 oz the next afternoon! As we settled in to our post delivery room for the next few days, we noticed that Libby had started making a consistent grunting noise. Thankfully our nurse Lauren quickly responded upon hearing her and took Libby to the nursery to be checked. The longest night of my life was before me as they called to tell me that Libby was going to the transition nursery for closer observation, and then the next morning the news that she would be admitted to the NICU. After more tests, many tears and waiting what felt like an eternity, we were told that Libby had tested positive for Group B Strep (GBS). My GBS test had been confirmed negative at my 36 week appointment...how could this be? Tom and I were informed the next steps and the many unknowns of what was ahead for our little girl. Tom and I held each other as we cried and felt like never before in our life. We couldn’t hold our baby; she would be going through more tests than we had both experienced combined in our lifetime, and that we should prepare for Libby to stay at least two weeks, if not longer, in the NICU. Her treatment plan ended up being 11 days of continuous antibiotics administered through a picc line that was placed in her tiny little heel. Tom and I spent the next 11 days by Libby’s side trying to cherish those first few newborn days with our baby like any new parent would want to – holding her, feeding her, and learning as much as we could about how to care for her once we returned home. Leaving the hospital without our baby was the hardest day of my life and every night we said goodbye as we left the NICU ripped our hearts out. Finally we were discharged home, yet 3 and a half weeks later life would be turned upside down again. After a fussy day with Libby, she began to display signs of respiratory distress and grunting. Tom and I took her temperature for what felt like the 100th time of the day and as we saw the temperature approach 102, we immediately got in the car, called the pediatrician and kept praying for our Libby while making the terrible ride to the ER while Libby had become unconscious. Nobody wants to hear these words again, but doctors informed us later that night and the next morning that Libby had developed RSV and GBS infection again. We faced a long month of tests, team meetings with our doctor team, and making our home away from home at the Vanderbilt Children’s Hospital. Libby would be in the hospital for 3-6 weeks since the infection had settled into her jaw. It was a joyous day when we got to parade through the line of nurses wishing us well as we finally got to take our Libby back home! Libby is a miracle in so many ways. Many moms and dads do not get to share such a positive outcome when their little one is impacted by GBS. 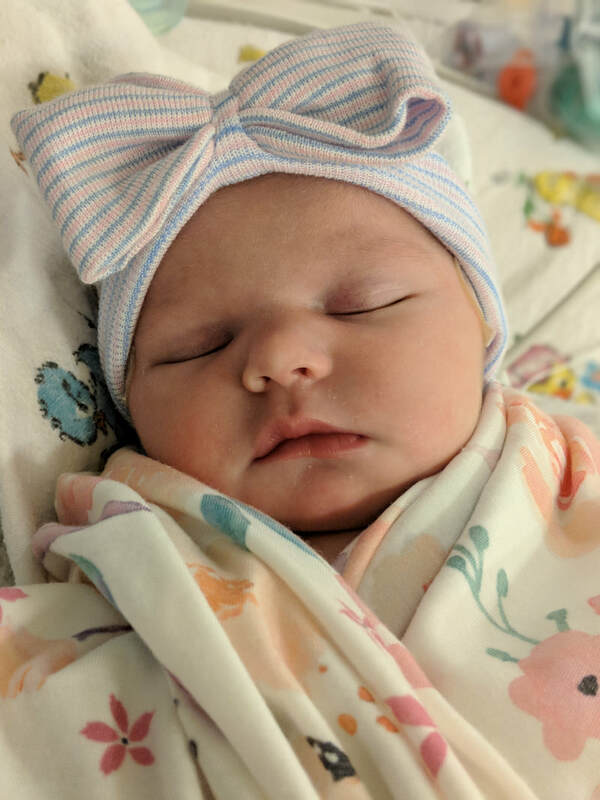 Every doctor and nurse that we encountered our on path is like an angel to us, and we are beyond lucky to say that Libby is a thriving, growing, and a healthy little girl today! Both times, the bacteria spared her brain and we are overwhelmingly grateful. Vanderbilt Children’s Hospital is an amazing resource and wealth of knowledge that helped save our baby’s life. Thanks for reading our story!